United Installers is a one stop remodeling company that will offer you a total package for your project which in addition to installation of cabinets, counter-tops, floors and appliances could include electrical, plumbing, drywall, framing and painting work. 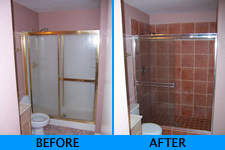 With us you will only have to deal with one contractor for all your remodeling needs. Please click here to have a look at BEFORE & AFTER photos from some of our projects. Installation of new floors, walls, cabinets, counter-tops, backsplashes, appliances, etc..